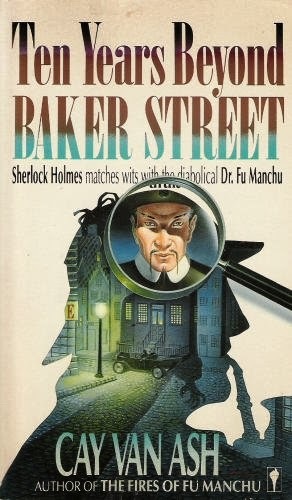 In this excellent authorized novel by Cay Van Ash, a close friend of Sax Rohmer's, Dr. Petrie enlists the aid of the retired Sherlock Holmes to rescue Nayland Smith from Fu Manchu's clutches. Holmes, Nayland Smith, and Fu Manchu were all identified as Wold Newton Family members by Farmer. In fact, Farmer proposed that Smith's mother was Sigrina Holmes, Sherlock's sister. Win postulated in his essay "Who's Going to Take Over the World When I'm Gone? : A Look at the Genealogies of Wold Newton Family Super-Villains and Their Nemeses" that the reason Petrie (who narrates the novel) omitted any mention of Smith's relationship to Holmes from his account is because Holmes helped bring Smith's paternal grandfather, Culverton Smith, to justice for the murder of his nephew, Victor Savage (as recounted by Watson in "The Adventure of the Dying Detective," edited by Conan Doyle.) Van Ash captures Rohmer's (and Petrie's) voice extremely well, and is very faithful to both the Holmes and Fu Manchu canons. Out of curiosity, has any fiction been published that is specifically intended to be set in the Crossover Universe-- not just Wold Newton, but the particular timeline set forth in Crossovers 1 & 2?